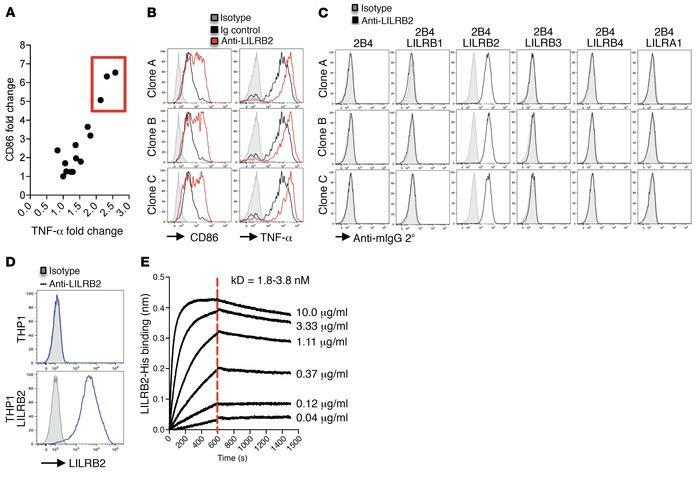 Anti-LILRB2 antibodies enhance LPS response in primary human monocytes. (A) Fold change of TNF-α and CD86 mean fluorescence intensity (MFI) levels relative to IgG-treated samples. PBMCs were cultured for 48 hours with LILRB2-reactive hybridoma supernatant followed by 6 hours of LPS stimulation (50 ng/ml) in the presence of brefeldin A. MFI values represent cells gated on CD33+ monocytes. (B) Raw CD86 and TNF-α data of highlighted clones (red line) from A. Data are overlaid on Ig control–treated PBMC data (black line). (C) LILRB and LILRA1 receptor recognition of highlighted clones in A. Antibody binding was detected using goat polyclonal anti-mouse IgG secondary antibody. (D) Expression of LILRB2 on THP1 parental cells and LILRB2 retroviral transduced cells. (E) Biolayer interferometry data testing LILRB2-His association with (t = 1–600 seconds) and dissociation from (t = 600–1,450 seconds) immobilized anti-LILRB2 (10 μg/ml). Concentrations of LILRB2-His and calculated anti-LILRB2 affinity (clone A) are shown.